3.11; the unforgettable day has come again… March 11th 2011 was the most tragic day for Japan in its postwar history. There are a lot of TV programs featuring the one year anniversary of the national tragedy and many memorial rituals and ceremonies to commmorate it are hosted alL over Japan and even some foreign countries, such as France, US, and others. And now, 3.11 2012, a special one year annversary and commemorative ceremony for the souls of the victims of the worst disaster in Tohoku and East Japan at The National Theater in Chiyoda ward where The Imperial Palace is located in Tokyo. 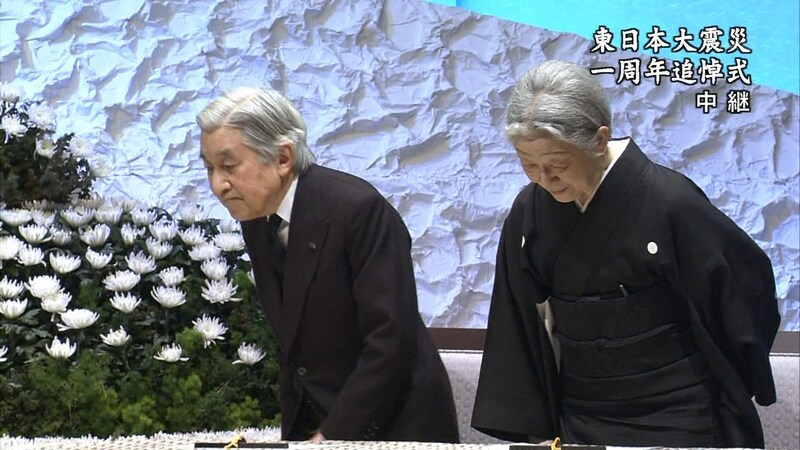 Our emperor, empress, each head of the three branches of the government including Prime Minister Noda,and about 1,200 survival family members from Miyagi, Fukushima, and Iwate attended this special memorial ceremony. The emperor, to whom this was the first official activity since discharged from the hospital after having undergone a bypass heart surgery, gave a remark, saying,”I do expect all of our people keep making constant efforts to sympathize with the sufferers in order to improve the circumstances of the damaged areas and ” , extending deep condolences to the sufferers and areas. Some survival family member says, “Considering the chagrin and despair of the victims and huge grieves of the breaved families, i am entirely speechless.” Even young children who are sufferers participated in the solem ceremony.